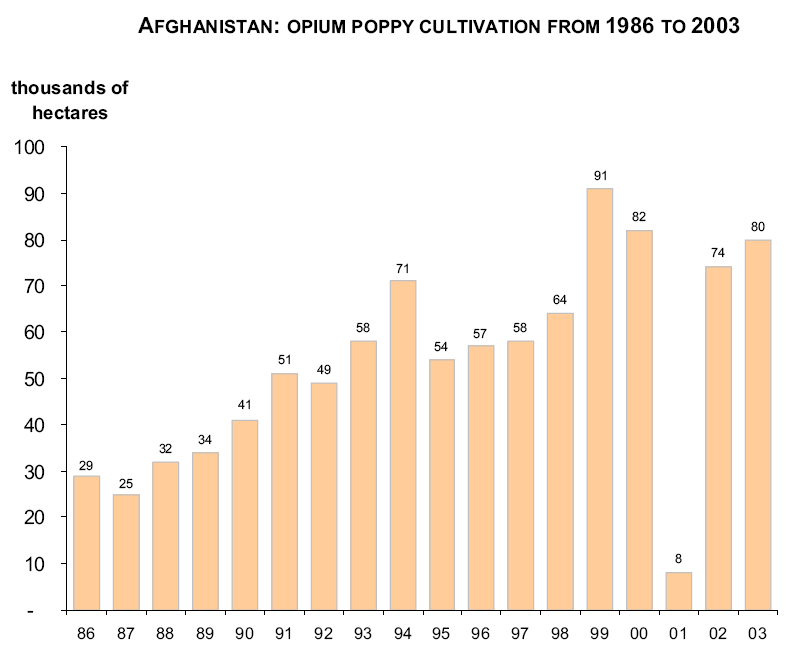 During the second half of the 1990s Afghanistan became the world?s largest source of illicit opium and its derivative, heroin. 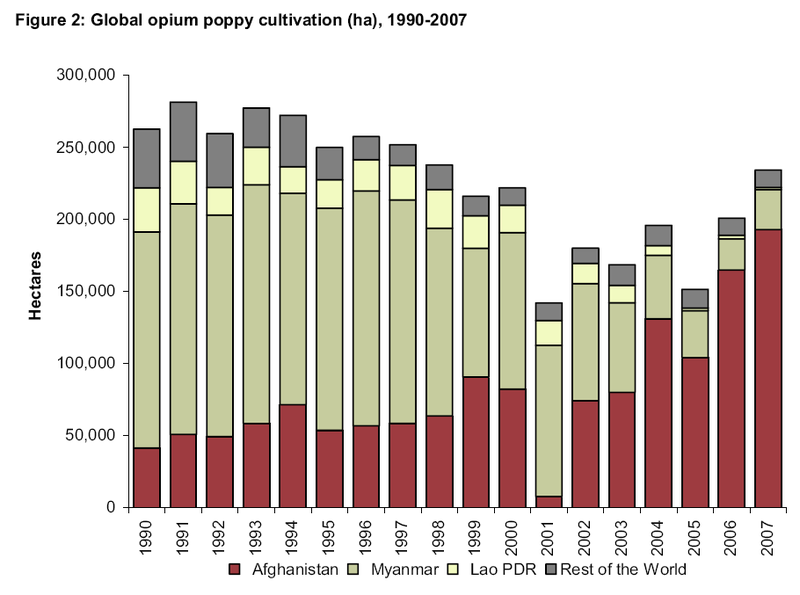 In recent years, the country has produced more than 3,000 metric tons of illicit opium annually (over 2/3 of the world?s production). About 10 million people (2/3 of opiate abusers in the world) now consume opiates of Afghan origin.Among the most affected societies are Afghanistan?s neighbouring countries, Russia and Europe. Heroin injecting is also fuelling the HIV/AIDS epidemic in Central Asia, Russia and Eastern Europe. 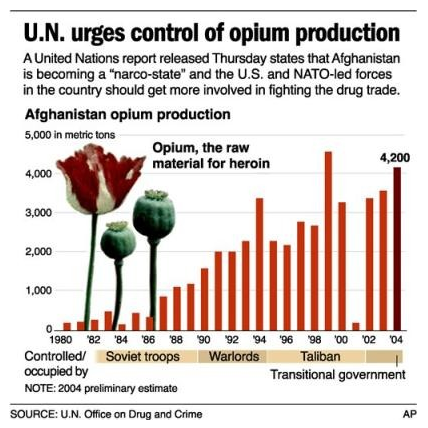 Along the trafficking chain from Afghanistan to Europe, it is estimated that more than half a million people are involved in the international trade of illicit Afghan opiates, which generates a total turn-over of about US$ 30 billion annually. 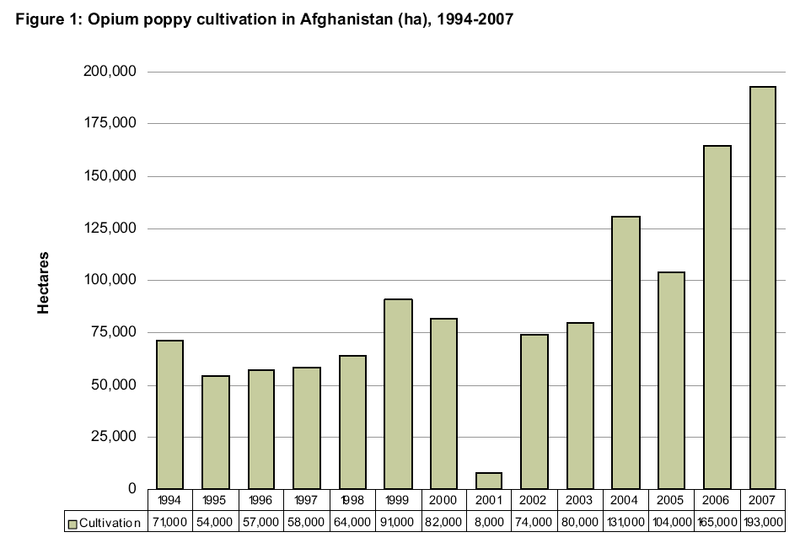 In 2001, following the ban imposed by the former Taliban regime, an abrupt decline of illicit opium poppy cultivation interrupted a two-decade increase. 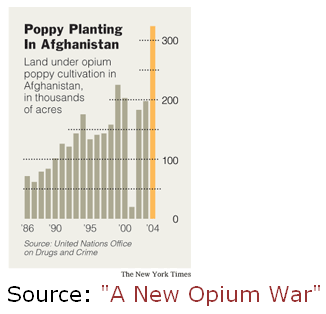 It also stimulated a subsequent 10-fold increase in opium prices. After the fall of that regime, cultivation resumed at a high level in 2002 and started to spread outside the traditional areas. We're supposed to believe that Afghanistan was invaded to capture an Arab who, although reported as having died in December 2001 in the vicinity of Tora Bora after succumbing to an untreated lung condition, has been happily living in a cave for over seven years despite requiring kidney dialysis every three days. Why he can't be found, and why "he" never speaks about events of 2002 or later in videos unless a still image mysteriously replaces the video footage during reference to the more recent events, is just a mystery which would only be queried by "terrorists", "anti-Semites" or "conspiracy theorists". Never mind, "suicide hijackers" can be simultaneously alive and dead (like Schrodinger's cat), so why can't OBL?